Calculation of tiles needed for floors and walls is so simple and easy. in this post, I will discuss how to calculate no. of tiles required in a room. So let’s start. let the length of the floor = 14 feet. Breadth of the floor = 12 feet. ∴ Area of floor = length of floor x breadth of floor = 14 x 12 = 168 sft. There are different tile sizes such as 20cmx20cm, 30cmx30cm, 45×45, 60cmx60cm etc. In this calculattion we will use 60×60 cm tiles. Breadth of 1 tile = 60 cm. 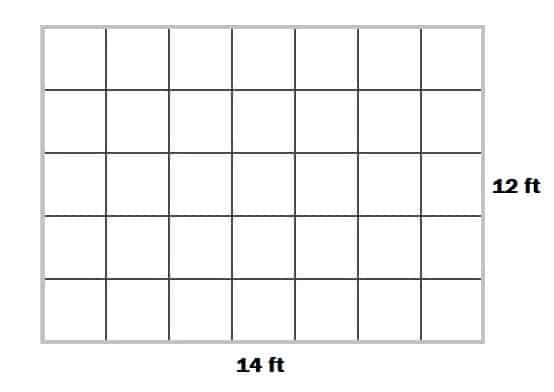 ∴ Area of 1 tile = 60 x 60 = 3600 cm² = 3.6 sft. ∴ No. of tiles required = Area of floor/ area of 1 tile = 168/3.6 = 46.6 ≈ 47. ∴ 47 tiles are required for the above floor. Similarly, you can also calculate tiles needed for walls. Alot of thanks to our bloved for ,owning A loving heart giving out what you own.